Improved? The launch of the new iPad 3 is probably one of the highlights of 2012 - at least when it comes to the general interest displayed by the media. There have been innumerable rumors about the improvements-to-come before the device even launched, but the moment of truth has finally arrived – will the added changes be worthwhile for existing iPad 2 users? Up until the release of the 3rd generation Apple iPad, there were a lot that reminded us of the launch of the iPad 2: Numerous rumors electrified even casual users in the weeks prior to the official unveiling of the iPad 2 as well as its successor in San Francisco. During the time, it was the honored Steve Jobs who introduced the world to the first iPad successor despite his overt illness. Still, some "rumors" of the iPad 2 were proven to be dead-on -- the tablet received dual-core CPU and camera upgrades as suspected by many media outlets. Other rumors, such as a potentially higher resolution display, slipped into obscurity. Now, about a year later, the next iPad has finally arrived in yet another familiar form. Announced simply as "The new iPad", the device is, at first glance, essentially unchanged from its immediate predecessor. A dual-core heart still beats inside and the tablet is still operated exclusively via a beautiful touchscreen. The major difference, however, is the inclusion of the vaunted Retina display. There is no doubt about it -- Apple has once again one-upped the competition and will likely determine the direction of future tablet development from all manufacturers. But, does the simple screen change justify the whole hype around the device? Malicious tongues are already calling the new iPad an "iPad 2S" due to what they feel to be meager updates of the original iPad successor. We spared no effort and dived right into the raging mass of Apple zealots in order to be one of the first in line to get this acclaimed piece of technology. 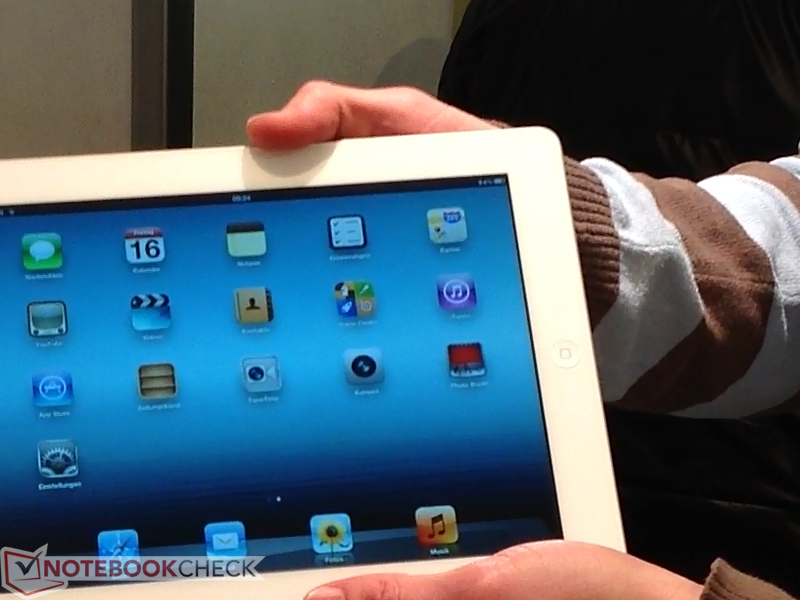 Two 16GB iPad 4G units were purchased at Gravis (a German Apple retailer) and used for testing. The review to follow represents our analyses of the device and our final impressions on the new tablet as a whole. It's true that the chassis of the new iPad has been changed when compared to the iPad 2. But, just like secret items in games, you're going to have to peek into every nook and cranny before being able to find what you're looking for. In detail, we see somewhat smaller radii in the rounding of the edges, a marginally larger recess for the rear camera and a thicker case with a total height of 9.4 millimeters. 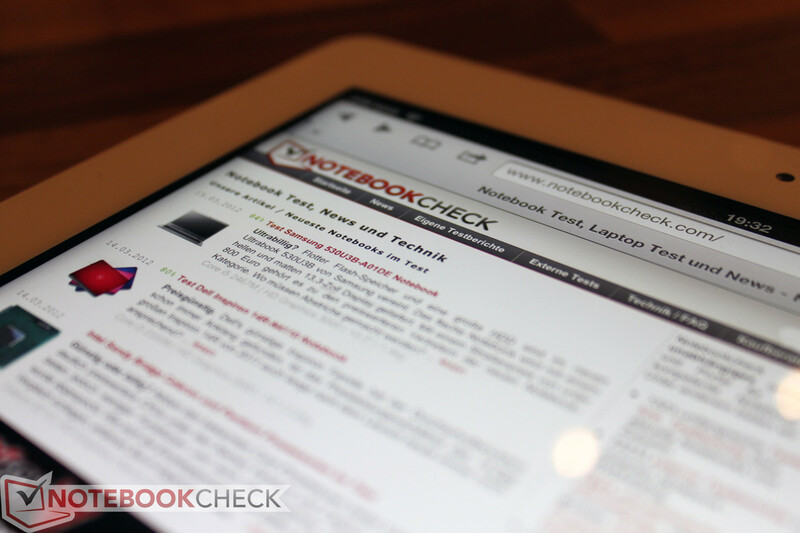 The thicker build, however, is only noticeable in a side-by-side comparison to the iPad 2. The difference is a height increase of 0.6 millimeters from the 2nd generation iPad. This just goes to show that everything newer is not necessarily thinner. The aluminum unibody case was likely one of the most important modifications in the leap from the iPad 1 to the iPad 2. This allowed the second iteration to be significantly thinner and lighter, which probably had a greater effect on the ergonomics of the device rather than the change from a single-core CPU to a dual-core CPU. "Never change a running system". In this case, we'll have to side with Apple on the matter and will gladly take the newer screen, larger battery and improved CPU made possible by the miniscule 0.6mm increase in thickness. The gain in weight, though, is much more apparent here. In the case of our 4G model, a total difference of 60 grams exists between it and the iPad 2, which makes the new iPad about as hefty as the original. 60 grams may not sound like a lot in notebook terms, but the difference can become quite noticeable when the tablet is held long enough. The weight increase is quite the significant turnaround considering that the reduced mass was one of the main arguments for the iPad 2 during its launch. 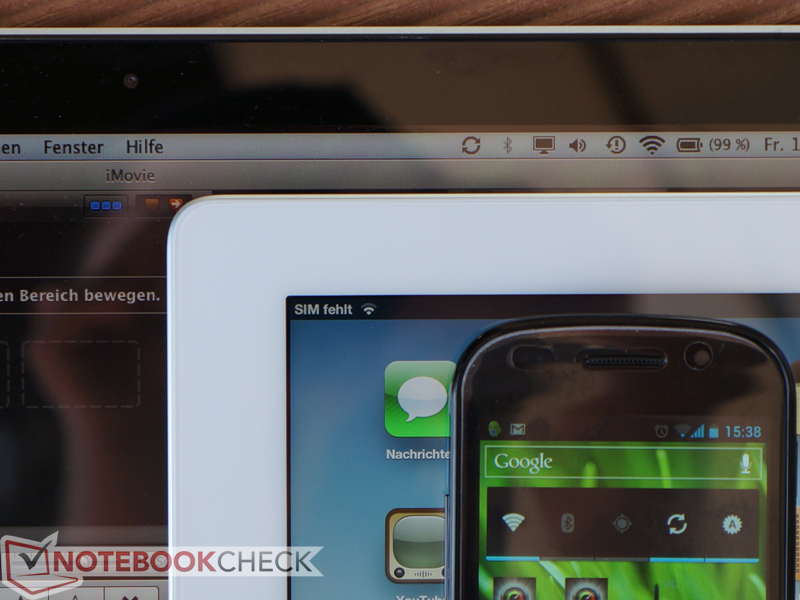 A few current Android tablets prove that a lighter weight is possible. The Asus Transformer Prime TF201 and the Toshiba AT200, for example, weigh about 589 grams and 535 grams, respectively. However, we should note that neither devices have any built-in UMTS function. Be that as it may, the mentioned devices won't likely be alternatives for the Apple buyer. Rather, it is more a question of what to do - should users buy an iPad 2 at a reduced price or get the iPad 3 and simply sell off the iPad 2? USB, HDMI and SD card slot on an iPad? Unthinkable, at least from the brilliant minds at Cupertino. After all, the goal is to sell a lot of accessories and to make iTunes an in-house cash cow with many subscribed customers. The overpriced 64 GB version can be seen this way as well. After all, the concerned customer doesn't want to suddenly be faced with problems caused by an overstuffed SSD. Rumors that Apple would stop producing this 64GB version have proven to be false as we expected. Left over is a 3.5 millimeter headphone jack at the device's upper edge and the familiar proprietary 30-pin docking port on the opposite edge. The corresponding USB cable also plugs in quite loosely due to the extremely beveled lateral edges which makes the connection feel unsatisfying to say the least. The iPad 3 can be connected to external monitors either via the expensive Apple keyboard dock (EUR 69 or $69 USD) or any corresponding adapters, for example the digital AV-to-HDMI adapter for EUR 39 or $39 USD. If Apple had the final say in connectivity, then cables wouldn't be used at all and users would be streaming pictures and videos via AirPlay (up to 1080p in the 3rd generation) to its Apple TV infrastructure. In addition, a Dolby Digital 5.1 surround signal is also transmitted via the digital AV adapter and can be fed into the corresponding home cinema system via HDMI. The list of supported audio and video formats is surprisingly long and interested parties should best study it directly on Apple's homepage. Otherwise, most users will likely ignore the feature. 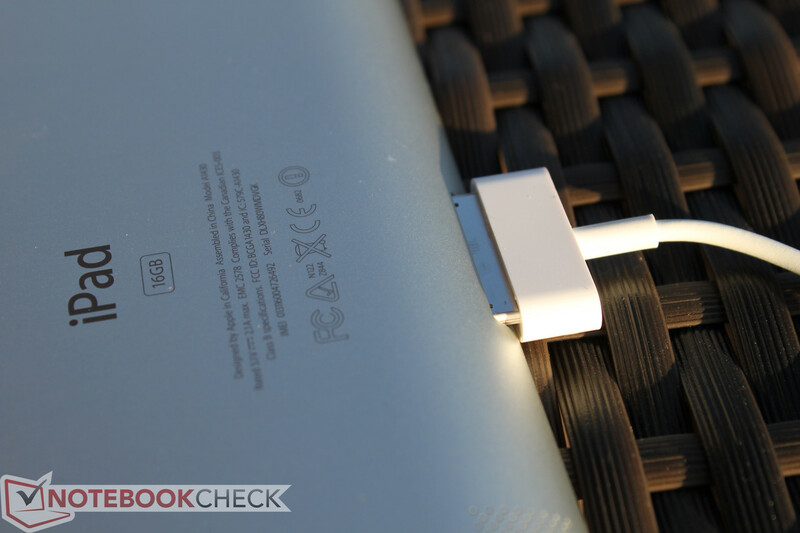 Now we come to a point that is likely one of the most significant innovations of the iPad 3 outside of the screen. LTE (Long Term Evolution), the so-called successor of UMTS, is supported by the iPad 3 for the first time ever. Theoretically, a wireless transmission of up to 300 megabits per second is possible, but the emphasis here is on "theoretically". First, the reception has to be at least adequate, so urban areas are preferred. Secondly, the service is only available in the USA (as of this writing) and you must have a corresponding mobile phone contract with AT&T or Verizon. A quick look at Apple's iPad 3 spec sheet reveals compatible network frequencies of 700 and 2100 MHz. The problem: Transmissions are only made on 800, 2000 and 2600 MHz bands in Germany and only 2600 MHz in Austria. German customers can either waive this feature and pay the full price anyway or simply wait for a potentially newer iPad 3 with DE LTE networking support. Does this mean no mobile Internet support for the iPad 3? Fortunately not, as the integrated broadband module also supports the tried-and-true UMTS, that works perfectly in certain European countries. As an added treat, the tablet also supports the fast UMTS standards HSPA+ and DC-HSDPA. Nevertheless, LTE support could have been an excellent pro argument for German customers. The potential of LTE could be massive: downloads of up to 40 Mbps and uploads of up to 20 Mbps have been reported from U.S. users. As of 2012, only high-standard cabled Internet connections can manage these kinds of speeds in certain urban parts of Germany and Austria. Speaking of connectivity, we must also not forget to mention the built in WLAN 802.11 a/b/g/n and Bluetooth 4.0. Here, we took a slightly closer look at the potential Wi-Fi range. Compared to a Macbook Pro 13 2010 and a Google Nexus S smartphone, the new iPad places itself a bit below the notebook in terms of range with a NetGear G-router as the Access Point. The connection broke off at a distance of about 15 meters to the router as it had to overcome some thin walls of glass and drywall panels in the test. We will update with another test on an n-standard router in the near future. Comparison: 0.7 megapixel camera iPad 2 vs. 5 megapixel camera in the iPad 3<sup>rd</sup> gen. (different times of day). The inclusion of front and rear cameras on the iPad 2 was particularly praised by Apple, although their capture performances were average at best. The front camera was only sufficient for video conferencing in low resolutions while the 0.7 megapixel (960 x 720) rear camera proved to be nothing more than a simple toy with picture quality that wasn't meant to be taken seriously. See our comprehensive comparison tests between the cameras of the iPad 2 and various Android tablets. 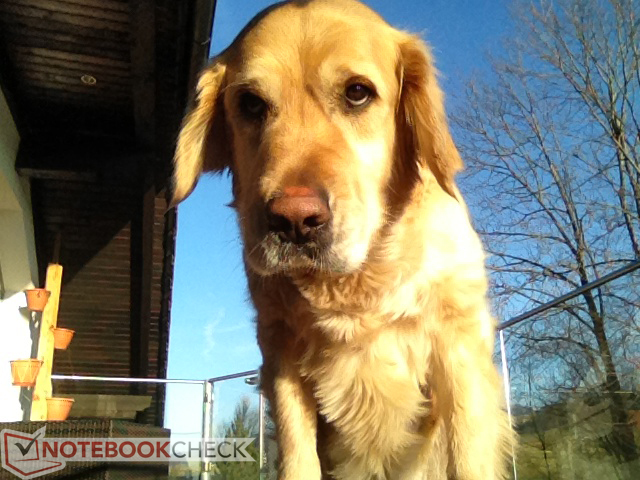 As a result, the cameras present a great feature opportunity for Apple to improve upon with the iPad 3. For starters, the company has replaced the weak rear camera with a more beefy 5 megapixel module, thus allowing for Full HD video recordings and an "infrared hybrid filter" for supposed improved handling. Features such as tap-to-focus and facial recognition software are also integrated and work as intended. We checked the new cameras with an indoor shot and a short outdoor clip in sunlight as to have the best possible ambient brightness and conditions. The outdoor clip shows slight jerks during fast camera movements. 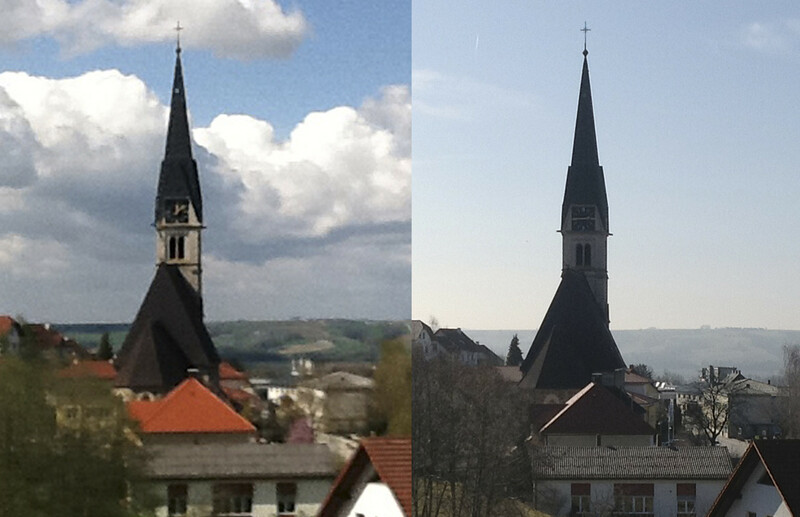 Additionally, we can also see some slight image noise, although the recorded colors are subjectively acceptable. 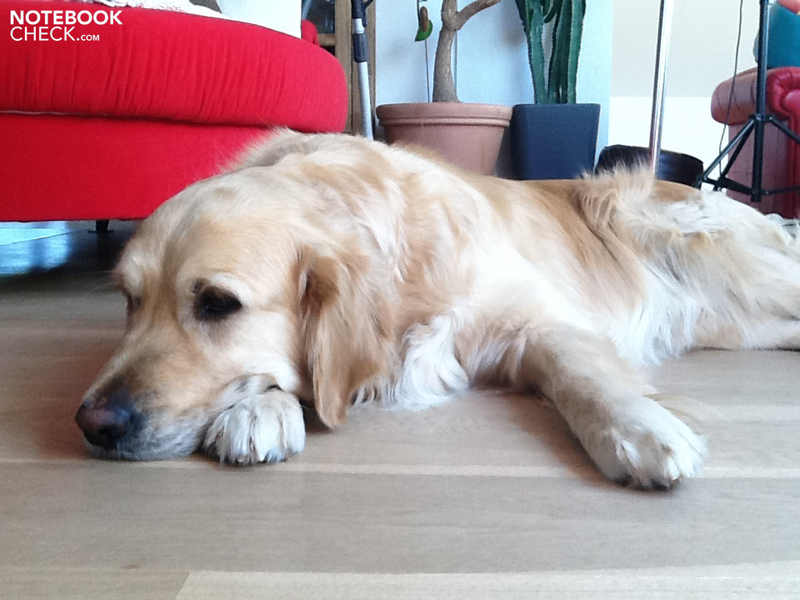 In our indoor clip, we can see stronger evidence of image noise. This is particularly prominent at the edges of the picture or object in question. The front camera doesn't do quite as well in terms of image quality either, but since it was designed to function primarily for video conferences, the quality should be satisfactory for video chatting applications. Our verdict for the new camera module is nevertheless positive. In fact, the new iPad is quite suitable for outdoor vacation clips. The Full HD (1080p) video clips subjectively display true colors and high details. However, be advised that recording with moderate to fast camera movements could result in less than satisfactory videos. The quality indoors is still reasonable, although significant weaknesses are more evident here. For example, the camera's fairly high default zoom setting needs a bit of getting used to. Focusing on particular objects in the distance with the tap of a finger worked well in our tests, but sometimes it would unexpectedly blur the entire picture due to focusing issues. 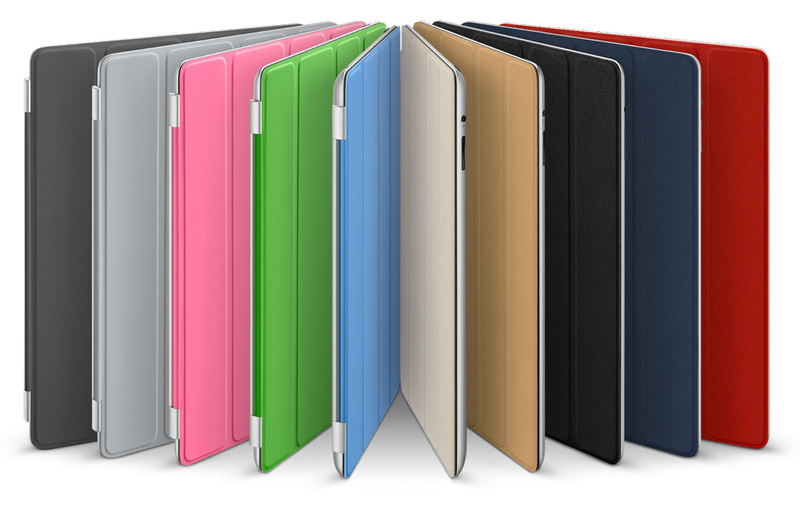 First some good news for all proud owners of iPad 2 Smartcovers: Your colorful, origami-style lid also fits on the new iPad 3. The lid costs, depending on material, EUR 39 ($39 USD) for polyurethane or EUR 69 ($69 USD) for leather. However, the Smartcover only protects the screen. This means that the aluminum body (in particular the rear) is still exposed to the merciless environment. Instead, the cover basically enables you to position the iPad in two different angles, which can definitely be useful when typing on a table or watching a video. By the way, the cover is kept in place by magnets, which also allows you to remove the cover quickly and easily. The completely sealed case doesn't give the user any room for hardware-sided modifications. Inserting and swapping the SIM card (still a micro SIM) is the absolute maximum that Apple allows - or trusts - the user to do on his or her own. The warranty on the new iPad 3 amounts to only a basic one year service. That means the device has to be sent back or brought to an Apple retailer in case of damage. Beyond that, Apple offers the AppleCare Protection Plan for iPads, which extends the warranty and telephone support two years each for EUR 79 ($99 USD). Now we come to the main innovation of the third generation iPad - the Retina screen. No manufacturers have yet to market a product sporting such a display, so Apple has taken the first go at the LED backlit 9.7 inch screen with a high resolution of 2048 x 1536 pixels. Compared to the iPad 2, this equates to a quadrupling of the displayed pixels (3.1 million pixels vs. 0.8 million in the iPad 2). The benefit of the high resolution is seen as razor-sharp reproduction of text and graphics when surfing on the Internet or playing games. Here, text is perfectly legible in full view, although the single fonts only have a size of one millimeter by one millimeter. Another advantage of the quadrupled resolution is the high-quality upgrade of old applications. We compared colors of the iPad 3 and the iPad 2, only to find that applications look exactly like how we knew them on the iPad 2. We measured a maximum luminosity of "only" 321 cd/m2 at an average brightness of 303.7 cd/m2 in the brightness test. This is a decrease of nearly 70 cd/m2 with regards to brightness compared to the predecessor, which we reviewed. Members of the Android division, such as the Asus Prime TF201 with 484 cd/m2 or even the Blackberry Playbook from RIM with 491 cd/m2, achieve much higher brightness levels here. It's interesting that our second test device (same configuration, but in black) consistently reaped in higher results in the brightness evaluation. The determined rates were averagely around 25 cd/m2 higher than that of our white version. We can't say if this is a production-related fluctuation or if perhaps the two iPads under review each sported different screen models. The reductions that the new Retina screen has made on brightness is regained in terms of image contrast. With a low black value of only 0.38 cd/m², the tablet reaches a maximum contrast of 839:1. Our second test device is practically on a par with 826:1 in this case. A high brightness is of great importance particularly when the tablet is used outdoors. We can give the all-clear signal in this regard. The biggest obstacle is still the reflective screen that can essentially be used as a make-up mirror in unfavorable angles to the sun, as is the case in practically all tablet rivals from the Android world. The potential brightness is basically high enough that the device can be used outdoors, but areas with shade would be the optimal spots. But when under sunlight, 100 - 200 candela more wouldn't have hurt, although it would probably rocket the already high power consumption of the Retina screen into dramatic regions. As to the viewing angles, the Retina screen is virtually perfect due to the implementation of IPS technology. No matter how we hold or turn the tablet, the content's legibility always remains flawless and true. 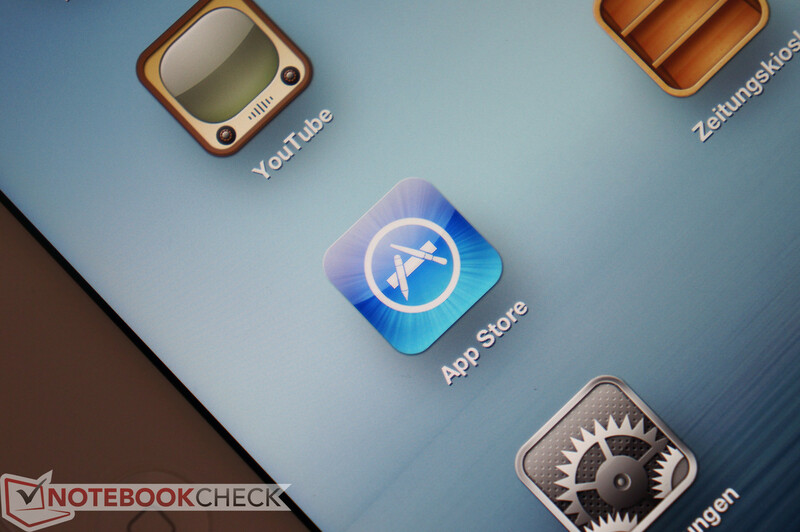 Instead, users should be more concerned with the potentially annoying reflections. 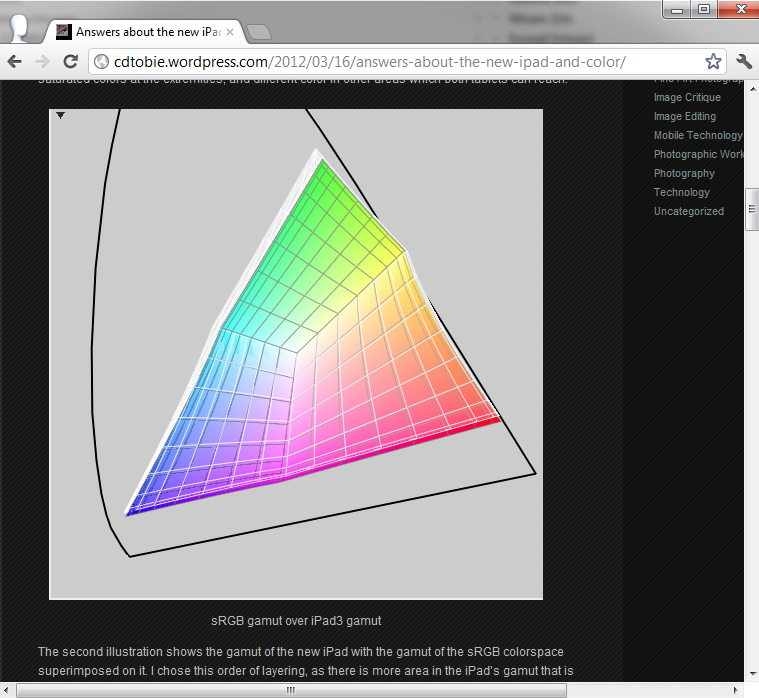 There's also good news for photographers and professional image editors as well as graphic designers: According to CDTobie's Photo Blog, the color spectrum of the new Retina screen is a bit wider compared to that of the iPad 2 and almost completely covers sRGB. Moreover, the company Datacolor offers an app for the iPad (SpyderGallery) which can calibrate the screen via a Colorimeter. The hardware specifications of the new Apple A5X SoC (system-on-a-chip) are a bit disappointing after all the rumors. A dual-core A9 ARM processor with a core clock of 1 GHz (according to the benchmark tools) is still used and thus, the processor performance hasn't changed compared to the iPad 2. The Geekbench scores of the computing unit consequently correspond to those of the iPad 2. With four Cortex A9 cores in the Tegra 3 and higher clock rates, Nvidia theoretically offers a lot more CPU power. The new Qualcomm Krait should also be faster due to improvements in its architecture. As to the graphics card, Apple had to make vital improvements because the high-res screen requires considerably more power, especially for games. Apple has incorporated two additional PowerVR SGX543MP graphics cores, meaning we still have to wait patiently for the new SGX600 range. The graphics card's theoretical performance is doubled due to the additional cores - but with a quadrupled pixel count of the screen. Consequently, 3D games have to omit a few details in the native resolutions, or reduce the frame rate. 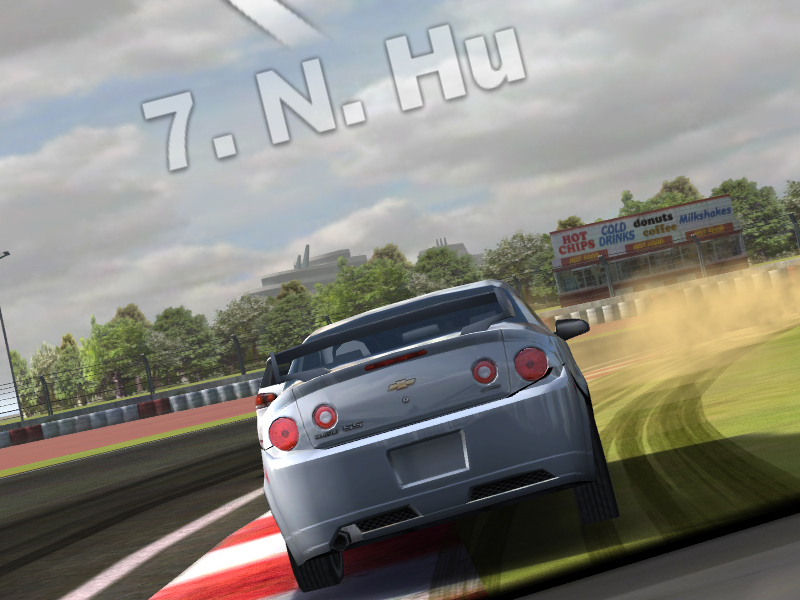 This is also shown in first tests with Real Racing 2 HD (version adapted for Retina screens). Although the racing game's resolution is certainly awesome, the cars can't be moved over the track quite as smoothly anymore. If 3D developers stick to the (likely sufficient) XGA resolution, additional graphical effects could benefit considerably. An appreciated improvement of the A5X is the doubling of the main memory to one gigabyte. Here, also possibly owing to the new screen, the memory capacity is also convenient for surfing on the Internet with multiple tabs. In our first short test experience, the A5X does a fair job with surfing and gaming anyway. Every now and again (especially using the search), we noticed slight stutters and hitches in the iOS. That is actually unusual for Apple's mobile operating system. The new high resolution screen enables the user to display even FullHD videos without loss of information. Apple now enables this by supporting H.264 videos up to 1080p in High Profile 4.1 (see tech specs). If you have videos in a different format, you will either have to recode them or use third-party player software. We looked closer at OPlayer HD Lite, CineXplayer and AV Player HD in the test. The verdict is rather sobering after numerous tests. Since the 3rd generation iPad doesn't bid a higher CPU performance, 720p is the upper limit for most formats. 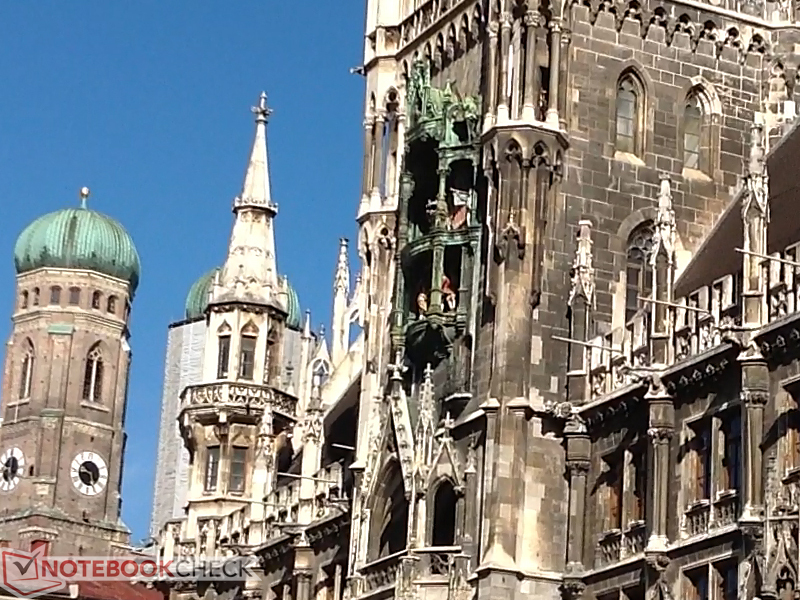 None of our 1080p test videos (H.264 in MKV, WMV9 or Ogg Vorbis) could be rendered smoothly. Moreover, the 720p versions hitched occasionally in some players (e.g. asynchronous sound) so that you are only on the safe side with SD videos. There's still good news about the system noise - there is none. The 3rd generation iPad works absolutely noiselessly like its predecessor and most other Android tablets. Neither of our test devices know the meaning of whirring or beeping. The surface temperatures seem to be one big shortcoming of the third generation iPad. During our battery load test, the tablet was simply placed flat on the table and it already heated up to 34 - 40°C. 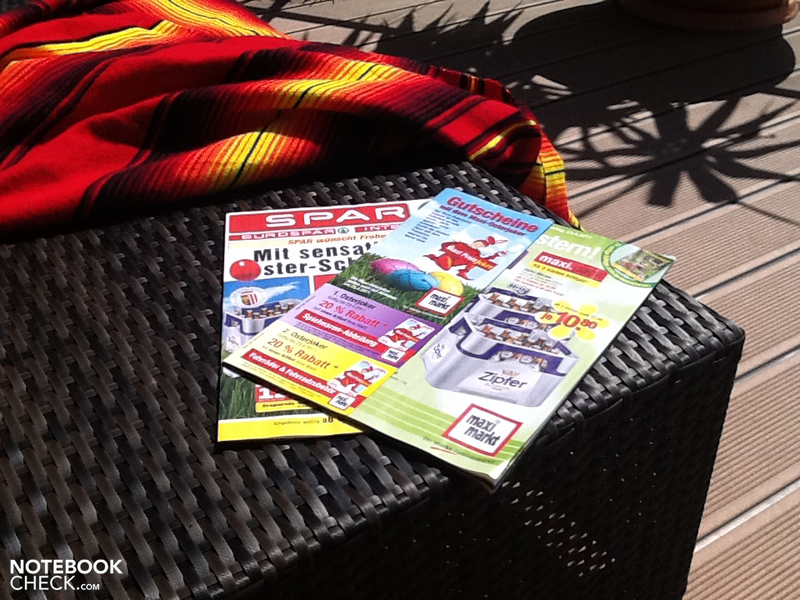 We can only imagine surface temperatures if the tablet were to be used outdoors in the summertime. We also measured surface temperatures of up to 38°C without load with the tablet flat on the table. However, the temperature reduces to 34°C when the tablet is held in the hand (without load, mind you). In any case, the user can either grieve or enjoy warmed hands during intensive gaming sessions. (±) The average temperature for the upper side under maximal load is 36.1 °C / 97 F, compared to the average of 30.7 °C / 87 F for the devices in the class Tablet. (±) The maximum temperature on the upper side is 40.7 °C / 105 F, compared to the average of 34.8 °C / 95 F, ranging from 22.2 to 51.8 °C for the class Tablet. (±) In idle usage, the average temperature for the upper side is 33.7 °C / 93 F, compared to the device average of 30.7 °C / 87 F.
The single speaker grille emits the music surprisingly loud and clear for the build. The positioning on the rear isn't ideal because the sound is distorted when the iPad is, for example, placed on a table. In our opinion, the rendered sound is nevertheless quite useful for background music and gaming sounds. The sound was played at a just sufficient volume and without noise in a test with the high-impedance AKG K701 connected to the headphone jack. The power consumption (measured at the power adapter with a fully charged battery) is on approximately the same level as the Transformer Prime. The iPad draws only 1.1 watts on the home screen in minimum brightness. 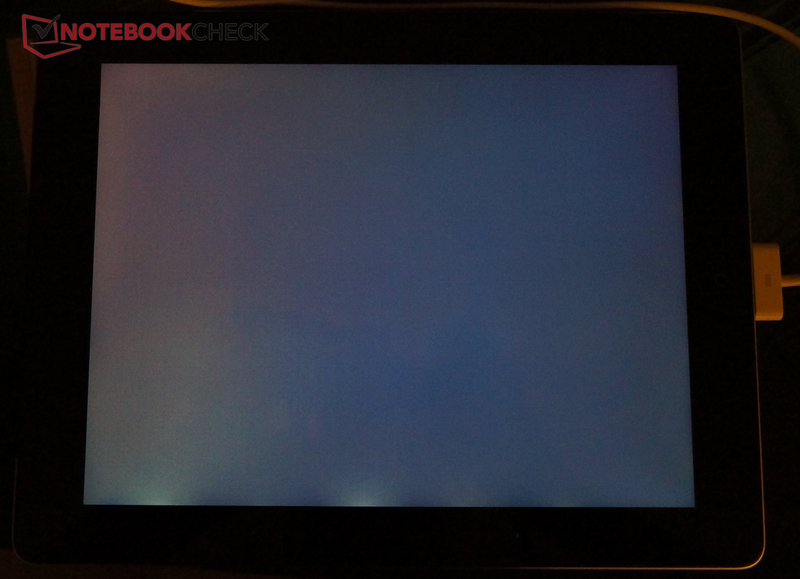 However, hardly anything can be seen because the backlight is almost completely turned off. The assessed maximum of 11.1 watts during load is marginally higher than that of the TF201. Our meter recorded 0 watts in standby. Thus, the real consumption will likely be below the measurement accuracy. Apple promises a runtime of 10 hours for the new iPad and our first estimated results in the Wi-Fi surf test can confirm this. With 9.5 hours, the huge battery (42.5 Wh) can reach the peak rates of the previous generation and guarantees excellent mobility. We simulated high load with the older Epic Citadel demo. Our second test device lasted for almost exactly five hours and thus allows gaming on the go for extended periods of time. We will add further battery rates in the course of the next few days. However, based on the results of other colleagues, it appears likely that Apple will keep its battery runtime marketing promises (e.g., 9 hours with 3G/LTE active). Nevertheless, the long time needed for recharging the battery is striking. For example, when the iPad is in use, it was only recharged to 7% after 1h 15min. Without using the tablet and connected using the power plug it tool 5 hours and 45 minutes to fully recharge it. Therefore, plan on overnight charging if you intend to use the iPad at its maximum battery capacity the following day. A hard and especially long day slowly comes to an end. This is time to draw a preliminary conclusion. What is left of the initial euphoria after the first tests? Above all else, the excellent Retina screen has to be mentioned. 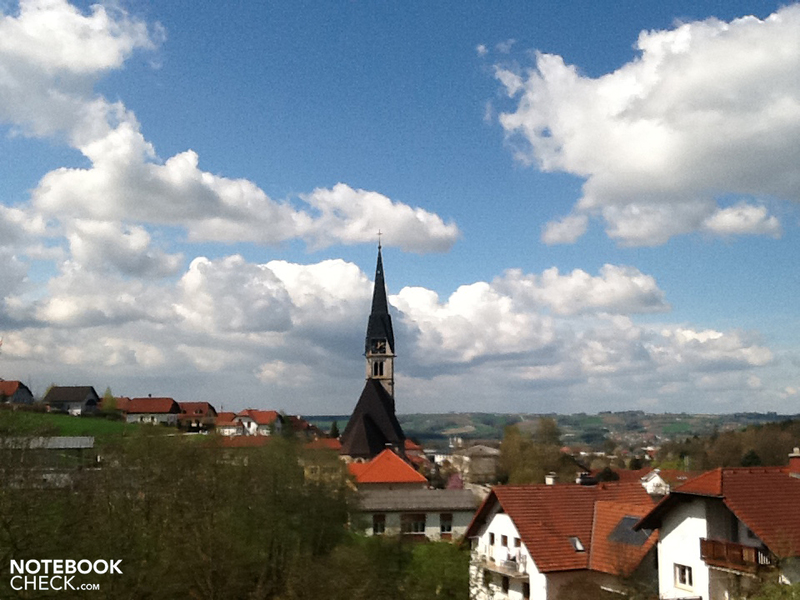 It is beyond all doubt the reason why the iPad 3 can produce a razor-sharp picture. However, the somewhat lower brightness, which can't counter glare quite as well, leaves a slightly bitter aftertaste compared to the predecessor. The Transformer Prime clearly wins the round in display brightness and contrast. Nevertheless, it can't hold a candle to the new iPad in terms of resolution and overall image quality. The case appears familiar both in quality and texture, although the somewhat heavier weight (+60 g) is the other side of the coin on an otherwise excellent and traditional design. German and Austrian users may be deterred about the incompatible frequencies for the LTE mobile communications standard. Thus, 3G takes over for 4G, leaving out one of the benefits that the newest iPad has to offer. Our preceding tests also lead us to our next complaint: The case heats up a lot more than the iPad 2 in every operating state. Surface temperatures of over 40°C can be easily reached when the tablet is left on the table to load. This temperature is a bit less dramatic when the tablet is held in the hand, but it still remains both measurable and palpable. In terms of performance, Apple still relies on a dual-core CPU, but pumped up the integrated graphics unit at the same time. This is likely a necessity since, after all, 4 times as many pixels is demanded by the Retina display compared to the display of the iPad 2. Whether or not high-demanding 3D games will fully exploit the quad-core GPU at max resolution remains to be seen. Classic couch-surfing is even more fun thanks to the now large memory of 1GB and, of course, the higher resolution. The only aspect that is still actually annoying is that we can't play flash videos. Apart from that, some pages are displayed with minor graphics errors because of the DPI settings and more complex websites would certainly benefit from a faster CPU. Overall, this verdict may sound a bit too harsh to the reader. In fact, Apple had to make a few compromises in the latest version of the iPad at hand so that a big step forward could be made in other fields. This is especially true for the Retina screen. A higher resolution equals a higher energy requirement; more power causes more waste heat and a higher power consumption. That can only be covered by a larger battery, which again makes the tablet a bit heavier and above all, in need of longer recharge times. Are these weight and power drawbacks justifiable for the inclusion of the new Retina display? We believe you should create your own opinion. The image quality is undisputedly state of the art. 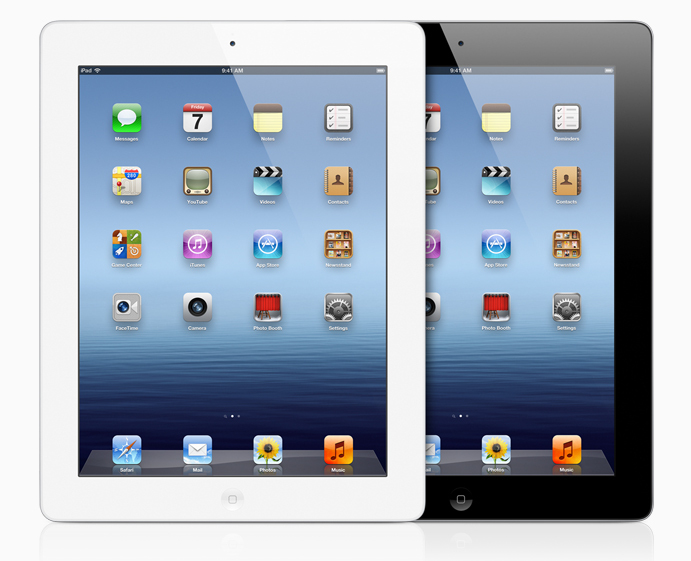 Whether this is enough to trade an existing iPad 2 for a next generation iPad is up to you. Besides, iPad newcomers will unlikely take a discontinued iPad 2 model anyway. Or would they? How Apple again sets standards and brings innovations in large volume on the market. As always in iOS devices - a bit more openness. No doubt the high resolution IPS screen. Complaints can actually only still be made regarding the reflective surface. The now price-reduced iPad 2 with a lower screen resolution, Asus Transformer Prime quad core tablet and the upcoming Full HD Android tablets from Acer and Asus.